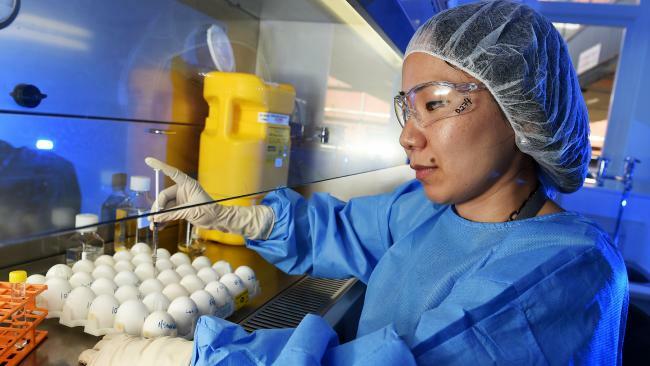 VACCINE manufacturer CSL has worked “around the clock’” to produce a new influenza jab in time for the upcoming season after a mutated strain caused havoc in the northern hemisphere. More than 100 children have died in the US because of the H3N2 virus mutation, which has rendered the pre-prepared vaccine for 2014-2015 useless. The deadly strain has forced Australian producers to ­­develop an entirely new vaccine, stretching resources and ­pushing production back by a month. “In order to produce a whole new vaccine, it takes more time, they needed an extra month, but by changing the strain we are covering for the strains that have caused all the problems in the northern hemisphere,” Professor Robert Booy, from the Australian Influenza Vaccine Committee, said. CSL spokeswoman Sharon McHale said that some doses had already been made available on the private market but it would take until April 20 for the national influenza immunisation program to ensure the vaccine’s safety for general ­release. Ms McHale reassured consumers there would be no ­repeat of a 2010 incidence of febrile convulsions in children under five associated with the then H1N1 Fluvax released to counter the pandemic. “Our vaccine is not available for use in children under five and between the ages of five and nine it is only recommended for use if other vaccines are not available after a risk benefit is weighed up by a doctor,” she said. Despite increased warnings, each year dozens of Fluvax shots are inadvertently or deliberately given to children under five. In 2012 Lachlan Neylan was left brain damaged after being given the CSL Fluvax shot in 2012 at age 22 months, two years after it had been banned for use in children under five. He was one of 115 children given the banned shot that year. In 2013 there were 44 children and in 2014, there were “34 confirmed administrations of bioCSL’s Fluvax given to children under five years of age,” a spokeswoman for the Department of Health said. “Fortunately we do not have any recorded adverse events from those administrations,” she said. Ms McHale said CSL had added more safeguards and warnings on the packaging to stop such mistakes being made again. “It’s a concern this is still happening, but there will now be a pop up on the pharmacist’s screen not to be used in children under five as well as labelling all over the package, on the syringe, on the box and on the outer wrapper,” Ms McHale said. Flu vaccines are not subjected to clinical trials because it’s time frame for development each year does not allow for trials. “Influenza vaccines have been around for years, so essentially it is the same medicine, only the strains change each year,” Ms McHale said. The virus is injected into fertilised hen’s eggs and incubated for several days before the virus containing fluid is then harvested and killed.